It is well worth the wait to grow your own asparagus. It takes a commitment of at least a couple of years for it to get going, but then it will produce for up to 25 years in your garden. 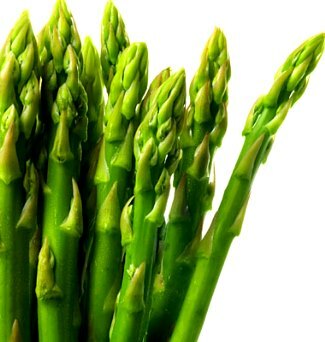 Asparagus (Asparagus officinalis) is a perennial vegetable, poking through the soil to say spring is here! High in dietary fibre, asparagus has an abundance of vitamin K and folic acid, and many other nutrients such as potassium, Vitamins A, C, B6 and K, riboflavin, thiamine, niacin, phosphorus and iron. 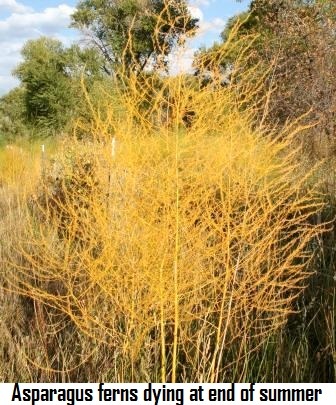 Asparagus are perennials, emerging each spring. They like a decent chilly winter to be dormant in, and don't mind if the top layer of soil freezes over. Once their growing season gets going in spring they need full sun. Most varieties will start producing well when temps hit 9°C (48°F). Growing asparagus from seeds is slow, so most growers buy two-year old root crowns from a nursery and get them in the ground a month before spring. If you're willing to wait an extra two years, growing from seeds is easy and cheap. Asparagus seeds sown in spring/summer germinate in 2-8 weeks, throwing up tiny spindly shoots. Let these die down in winter and before next spring transplant them into their permanent bed. It is strongly suggested that you purchase all male varieties of asparagus crowns. The female plants rarely produce nice fat spears, and their little red seeds will over-populate your garden. The seeds are also eaten by birds which disperse them widely creating a problem for native habitats. Sow seeds 1cm deep and 10cm apart using good potting mix in 15cm deep pots, trays or a sunny, sheltered trench. Smaller pots can be used which means you'll need to transplant the baby plants as they reach 10cm high. You can even sow asparagus seeds straight into their permanent bed as long as you keep them watered and said goodbye to any cold nights. Plant these seeds a good 45cm (18") apart or bit closer with dwarf varieties say 30cm. Rows should be at least 1-2m apart. Whether you plant seeds or crowns, they should be down a good 15cm in a hole or trench. As they grow you can cover with new compost each year. The crowns seem to push themselves into the right position, but if your plants are too shallow to begin with, they can't push down so they are prone to being blown over by the wind or damaged by scratching birds or other means. You will have to dig your no-dig garden, because you need a trench roughly 30cm (1ft) deep and the same width, or two trenches 1½m (5') apart. Half full with gourmet compost. Who loves rich feeding? Asparagus do that's fer sure! Place the crowns spreading out the roots, then cover with more compost or compost/soil mix. As the shoots start to appear, cover with more compost and then top with mulch. If your garden is soggy, best to mound up the soil and have a trench along the top. Asparagus dislike dry feet when growing, but hate waterlogged feet even more. These greedy feeders like at least a good 6cm (2") of compost each spring. They also like plenty of water when their spears are forming and growing, after which you don't need to worry so much. A deep layer of mulch, such as straw or woodchips, 10-20cm or more applied over winter, will help stop weeds and provide good conditioning for the growing season ahead. 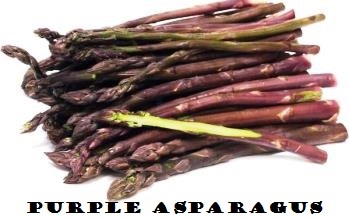 Out of the many varieties including wild asparagus, there are two main edibles sorts — green and purple. 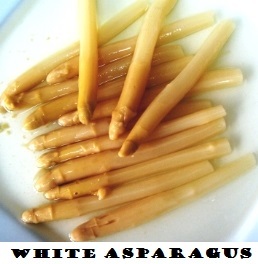 Actually you can grow or buy white asparagus, but that is just the green spears have been covered with soil as they grew. Pretty purple spears are only skin deep, but they are sweeter and because they have less fibre they are very tender to eat, raw or cooked. Patience is a virtue when growing asparagus. The first year of growing asparagus is hard, because no picking is allowed. Don't you dare even try one! Leave your plants to develop a strong crown system for better cropping in later years. After the first year in the garden — or two years if you sowed seeds (they are now 3 years old if you purchased two-year old crowns) you will be able to harvest for about two weeks before you should stop. That's it for that year. The next year, harvest for four weeks. Don't be tempted to go longer, let your asparagus plants mature further. Growing asparagus — then eating it! 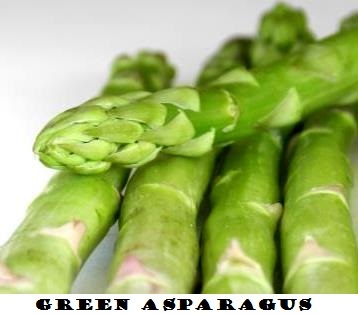 Asparagus is delicious hot or cold and it makes a great addition to any salad. Steamed for 5 minutes and with a dash of tamari and olive oil... ummm. Sauteed, stir-fried, it's versatile alright. If you need to store it, wrap in a damp paper towel and store in the refrigerator. Luckily asparagus growing is relatively free of problems and most varieties are resistant to diseases now, such as asparagus rust, crown rot and fusarium root rot. If you spy asparagus beetles dining on the fernery, act quickly and pick them off before they defoliate the plants which will not help the plants build up reserves for the next season. If you have an infestation, it's a good idea once the fronds have gone brown and died, to cut them down and put in your compost, as these beetles overwinter in this ferny growth. If no sign of beetles, you can simply bend the dried ferns flat over the ground and let them rot down and you can cover them when you put a layer of compost on ready for spring growth. 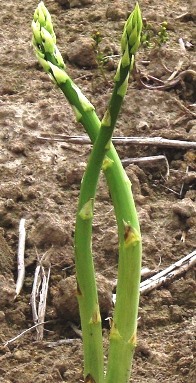 Aphids might appear on the tips of the spears. Hose them off and encourage beneficial bugs such as ladybugs.